PORTSMOUTH, RI--(Marketwired - Jun 4, 2013) - Malcom Technologies has introduced a new website featuring a GSA Advantage direct link for Federal, State, and Local Government agencies interested in purchasing hot air tools and heat guns for a wide range of maintenance applications. Malcom Technologies' Website provides Federal, State and Local Government agencies including military installations with a broad range of hot air tools, heat shrink guns, plastic welding tools, and repair kits for various maintenance applications. This website offers tutorials and videos for repairing boats, flooring, pipes, roofing, tanks, wiring, testing heat sensors, shrink-wrapping pallets, and more using standard tools. 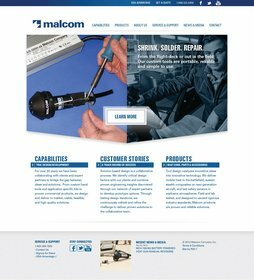 Featuring battery powered heat guns, plastic welding tools, and heat shrink tools, the Malcom Technologies Website describes the company's history of problem-solving using standard products and development of custom solutions. They serve many industries including aerospace, aviation, facilities maintenance, fire prevention, military, telecom, transportation, and utilities. The Malcom Technologies Website is www.malcomtechnologies.com. Malcom started in 1991 as a Manufacturer's Representative firm located in Andover, Massachusetts. In 1998 they started developing problem-solving products on their own including a portable battery powered heat gun, soldering iron, specialty heat tools used for composite applications, and a wide range of plastic welding tools and kits. These proprietary tools are used extensively by numerous military, government, and commercial facilities. From hand-held tools for soldering, plastic welding and shrinking applications to composite curing and smoothing, Malcom delivers high quality, problem-solving products quickly at a great value and serves many industries including aerospace, aviation, facilities maintenance, fire prevention, military, telecom, transportation, and utilities. Malcom Technologies' new website features a GSA Advantage direct link for Federal, State, and Local Government agencies interested in purchasing hot air tools and heat guns.